previous section, and then check the ‘Use Advanced Ranking Features’ box in Step 1 of the screener manager, circled below. This will create a few options. First, in Step 1 you can set a limit for how many stocks the ranked screener will return in Step 1 (the default is 50, but it may return up to 250 stocks). In Step 2, two additional options appear: percent weight and preferred order of score (boxed in the screenshot above). 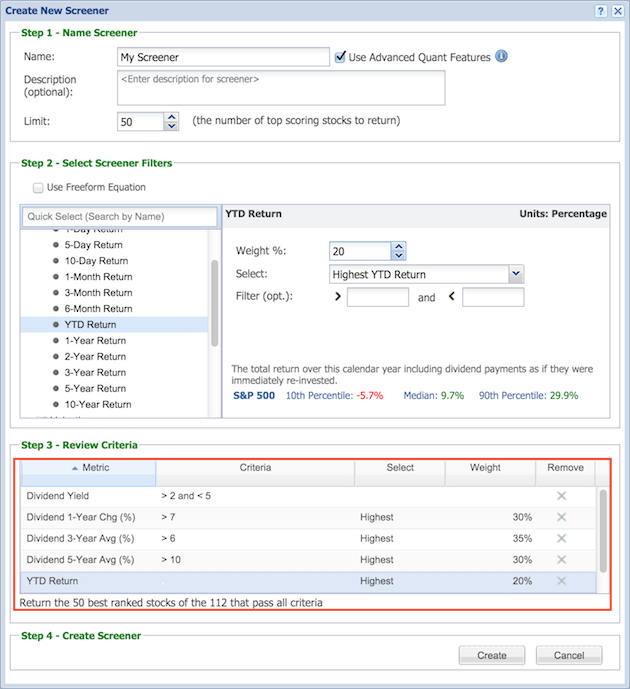 With the ranking feature activated, you can add filter criteria without using the weighting (as you can see below with the Dividend Yield criterion in Step 3), you can weight a metric without adding filter values (as you can see below with YTD Return criterion), or you can assign both a weight and filter values for a metric (as you can see below with the Dividend 1- and 3-year changes and the EPS criteria). Note that below Step 3 you can see the number of stocks that pass your screener, as well as the number that will be returned as specified in Step 1. 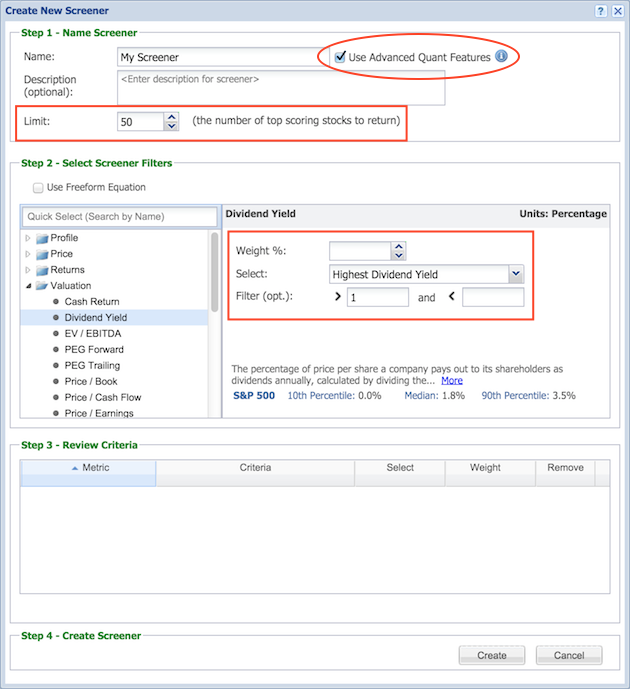 When you click ‘Create’ the number of stocks specified in Step 1 will be loaded in the Table. If you have weighted the stocks so that the sum of their weights is not equal to 100%, you will be prompted to either let Stock Rover auto-adjust the weights for you, or to adjust the weights yourself. You can choose to have Stock Rover always auto-adjust the weights by checking the box. 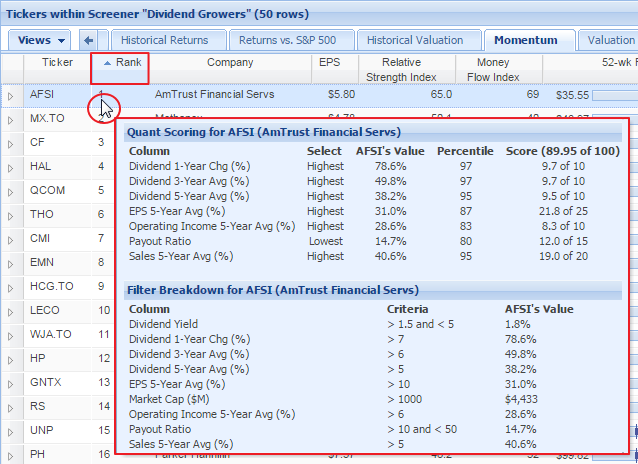 When you run the ranked screener, the top-ranked stocks will load in the Table and a ‘Rank’ column will appear to the right of the Ticker column with the rank of each of the stocks. If you mouseover a stock’s rank, you’ll be able to see information about that stock’s score. Note that the rank column will appear only when you are running a ranked screener; if you switch to a different dataset in the Table, the rank column will disappear. From here, a ranked screener can be accessed and modified in the same manner as an ordinary screener. Please see the Update a Screener section for more information. 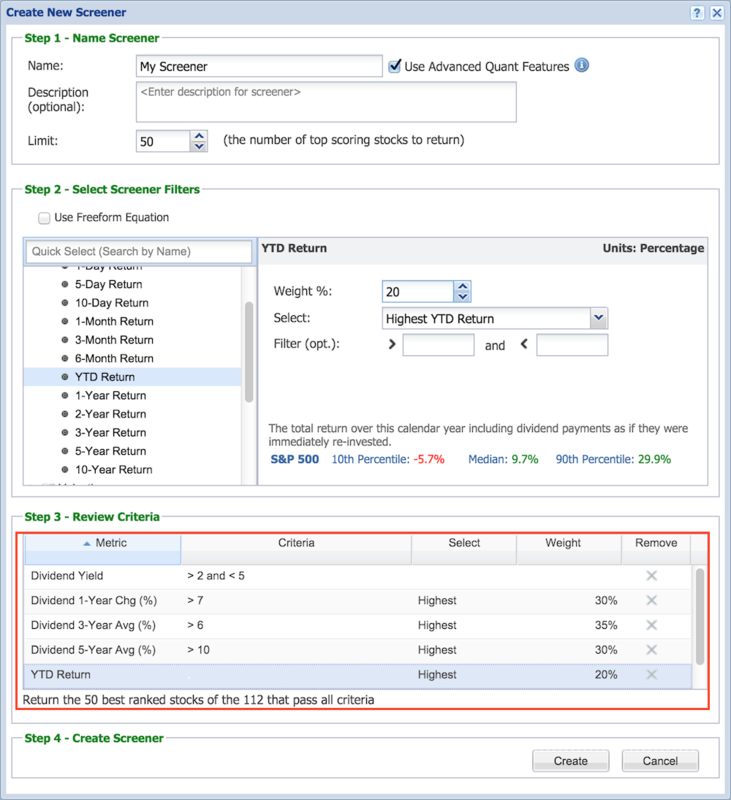 For more information on applying a ranked screener to a portfolio, please see the Apply a Screener to a Set of Tickers section.